Books. They’re heavy, they rip, the binding comes apart, they’re expensive. You read it once and never look at the book again, even if you swear you will read (but you don’t). Besides, most people read news stories and journal articles online. So what is the answer? Electronic books! E-readers! 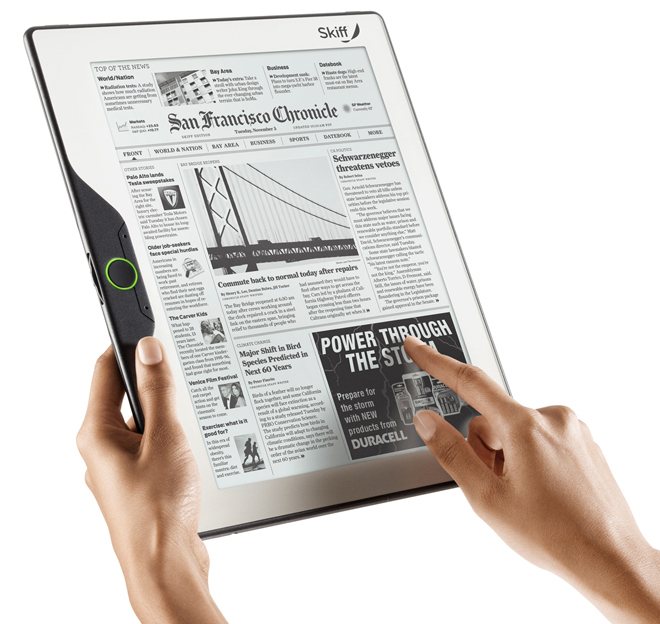 E-paper! Or any combination of words associated with electric and literature! A few of these have started popping up on the market. This story from the BBC features the latest edition of the technology built in the UK. You can download and store multiple books on one device, and they are becoming more and more damage resistant and flexible. There is also plenty of argument against these: They also break down, they need power (books don’t), they’re hard to read. If the device dies, so do all of your books. I’m fairly traditional, and like the smell and feel of paper. I like the weight of a book, and I like being able to loan my copy of a book to my friends, or co-read a book with my husband (usually done with large coffee table books). I certainly don’t look forward to moving when we have to transport an entire library of books, but I sure like having them there on our bookshelf. However, as a student it would be nice to have all of my textbooks in one package, and in one place. Although it certainly makes it harder to skim through two books at the same time, trying to find that passage you need for your final essay. So I’m curious what people’s experiences are with e-readers and what they think of them, or if they’ve boycotted their use and why.